Scottish Parliament hears support for register of judges’ interests MOI ALI, Scotland’s Judicial Complaints Reviewer (JCR) told MSPs at the Scottish Parliament earlier this week she supports a Register of Judicial Interests as called for in Petition PE1458: Register of Interests for members of Scotland's judiciary. 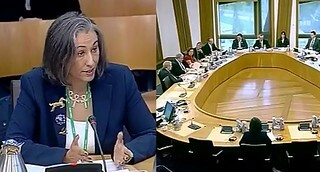 Detailed evidence provided by Moi Ali in response to questions from members of Holyrood’s Petitions Committee came as a stark contrast to the ‘vested interest’ protests of the now twice Committee no-show Lord President Lord Brian Gill, who has declared his opposition against proposals to require judges to declare their interests. 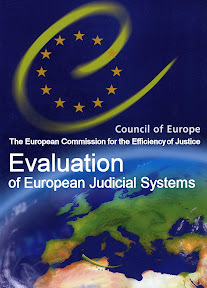 Several times during the Parliamentary hearing, the independent reviewer of judicial complaints took issue with the lack of transparency surrounding the judiciary, also drawing attention to the fact most others in public life must comply with Registers of Interest. Ms Ali also gave examples of critical cases & issues brought to her attention alleging a complete lack of judicial impartiality and failures of judges to recuse themselves when interests clearly conflicted with cases before them. 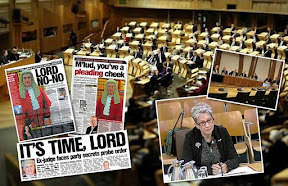 Speaking to members of the Scottish Parliament’s Petitions Committee on Tuesday, Moi Ali also challenged the Lord President’s insistence that the judicial oath to assess whether a judge should recuse themselves on a case should be enough to instil confidence in the legal process. "It clearly isn't," she said in response to questions from MSPs. Moi Ali went onto say "We are not talking large numbers but issues have been raised about undeclared family relationships and memberships of a variety of organisations." Moi Ali told the Committee : “One complainant said his appeal was heard by the son of the judge who presided over the trial, while it is suggested that judges "change their names to hide their family links to other judges". In response to further questions, Ms Ali revealed the Lord President and the judicial office have not kept her informed on cases she has asked questions on. 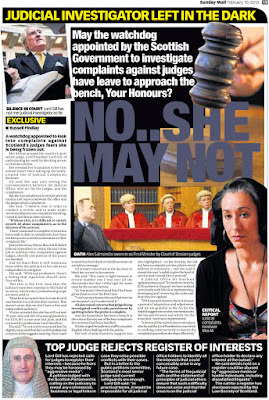 On the subject of a lack of judicial cooperation with the role of the Judicial Complaints Reviewer, previously reported by Diary of Injustice and the Sunday Mail newspaper HERE , Ms Ali said: "My concern is I might feel that the rules haven't been followed, send it back to the Lord President and then never know what happens. I feel somewhat as if my hands are tied because I can make suggestions but I can't do anything more than that. Ms Ali continued : "Recently there was a case I referred back which, I was told, would be reinvestigated but I didn't hear anything more. I asked the judicial office what had happened and they said they couldn't tell me because it was a matter for the Lord President. "I've written to the Lord President asking what I can expect, because I am unhappy about referring things back and not knowing what happened." 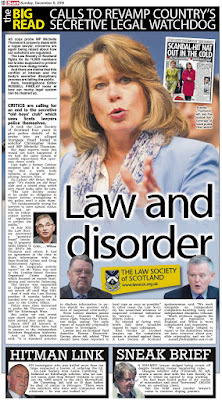 Moi Ali also revealed to MSPs that the Lord President is exempt from Freedom of Information legislation. 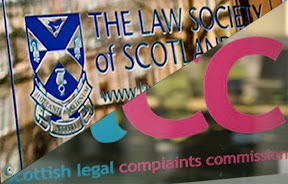 In further points put to the JCR, Jackson Carlaw MSP said: "From this committee's perspective, I think that what has been the focus of our attention here has been the Lord President's Edwardian establishment disdain for the hoi polloi, as I think the petitioner sees it, in terms of us having any right to understand these matters. 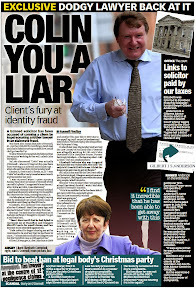 Mr Carlaw continued : "I wonder if you would put it more politely, but it does seem to me that you're not a million miles away from characterising it this way. 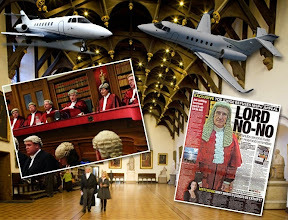 Is it still the case that the swish of judicial ermine and velvet should cow into deference both the public and the legislature in terms of our right to understanding these issues? "In this day and age, the reason that the Lord President appears to be against it is that it has not been so to date." Ms Ali responded: "I'd like to be as colourful as you are but I feel I can't at the moment. In any institution, in any sector, change is not always welcome, particularly change that is seen to be quite challenging. Most institutions resist that as it is seen as something of a threat, when actually I prefer to see it as an opportunity. "More transparency in any area of life can only be a good thing. 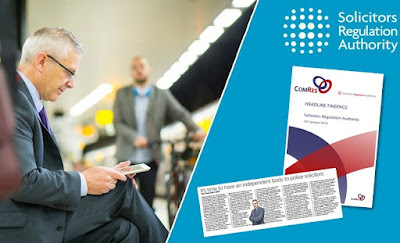 I know that there can be a downside, and I have read the judiciary's response to the petition which is that it is 'intrusive and could attract negative media reaction', but that goes hand in hand with accountability." 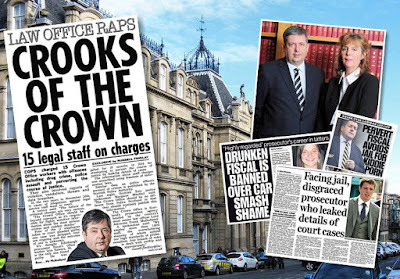 Commenting on a recent submission to the Petitions Committee made by the petitioner, Mr Carlaw backed calls to involve the Crown Office & Procurator Fiscal Service and Scottish Court Service who both operate Registers of Interests & Hospitality for their staff. 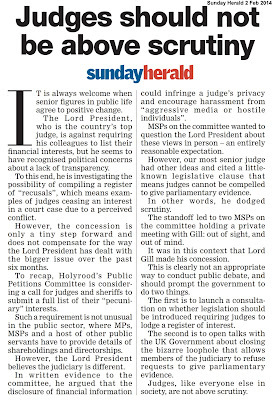 Mr Stewart continued : "The Lord President is next door at another committee. 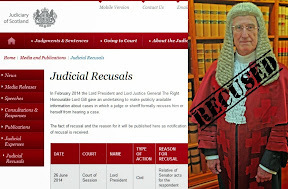 If the Lord President wishes to go voluntarily that is entirely up to him. However, we have made arrangements for myself and the deputy convener to meet the Lord President in a few weeks' time." 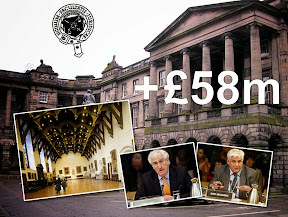 On concluding the evidence session, the Committee agreed to write to Dr Kennedy Graham MP, New Zealand Parliament, the Crown Office and Procurator Fiscal Service, the Scottish Court Service and the Scottish Government. The Committee also agreed to consider the debate that took place during the passage of the Scotland Act 1998 on section 23. The full transcript of the meeting which includes many important points raised by members of the Public Petitions Committee will be published on Diary of Injustice next week. 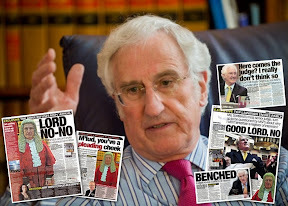 Lord Gill must be enjoying his no show tantrum with the PPC but it smells of cover up as a few in my office are now saying as in Lord Gill is giving his colleagues time to put their interests in order before the inevitable. Good support.Proves you are right all along about this register of interests and the judiciary. 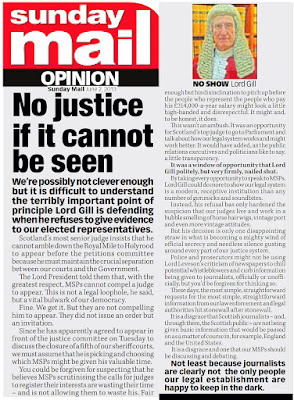 Any particular reason Gill wants to take the whole judiciary on a kamikaze run against your petition? 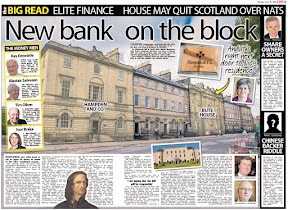 If this is the case there will be some uncomfortable headlines of financial interests and other situations being wound up before the register takes effect ... if of course the Scottish Parliament vote for it. Too much to hide by the sounds of it. 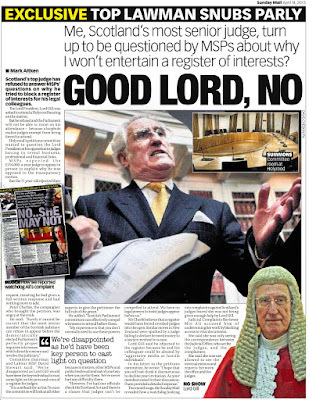 Lord Gill is not stupid and he must realise arguing against a register of interests is a dead end. So there must be something deeper to his opposition. 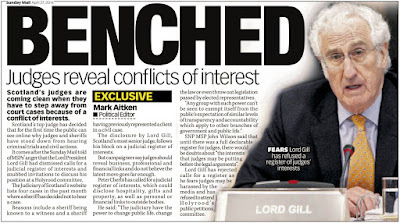 Perhaps Gill suspects or knows there are potential scandals brewing relating to judicial interests not made public. 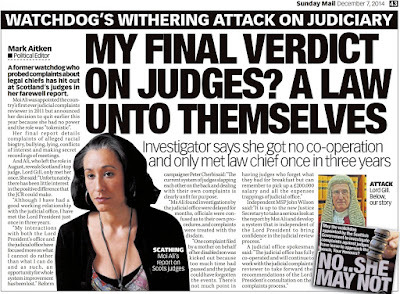 I presume from the Diary of Injustice response this is the case and the judges are going to find themselves in hot water whether a register comes along or not. 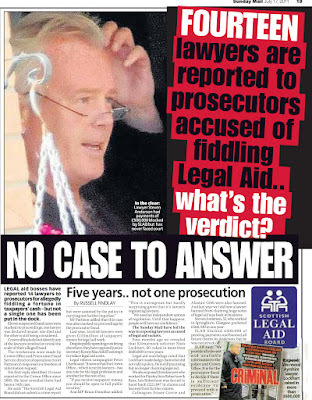 Is it any surprise this select bunch of people who are or become judges have much to hide? 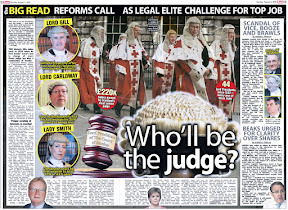 After all these are the same people the Government can rely on to back up all their bedroom tax and spying surveillance laws and rob the poor to give to the rich policies.Yes every time there is a challenge the judges are on hand to quash it to keep the powers that be in charge and they are part of the powers that be! Irrespective of the interests (and from what you have said in the paper it sounds like there are things to declare) the way the judges chose to defy the Scottish Parliament over this is simply not on. 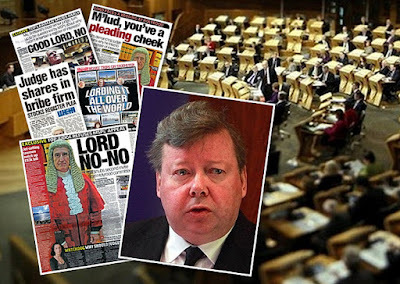 Threatening the Scottish Parliament with clauses in the Scotland Act makes a mockery of democracy and I noticed in the video clip Mr Brodie wants to find out who it was who inserted these clauses.Well I think we all deserve to know this because I think the judges themselves probably had a hand in this.More vested interests making sure they cannot face scrutiny from anyone except themselves and we all know where that gets us! Very interesting and mature debate and your blog.You have obviously put a lot of thought into this and it is great to see you have such support although the obvious point of more transparency is difficult to argue against. I watched the debate twice and have to say this is not exactly the line what we in England are being fed about the Scottish parliament. So I now have to ask why are we not having this same debate in England and why are our judges all exempt from declaring their interests? 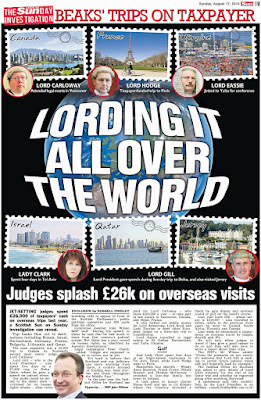 I think they should act now and bring this in before the judges do a runner with all their ill gotten gains! 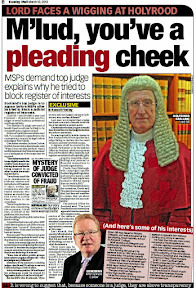 Clearly there is a lot of scandal buried in the judges laps otherwise the headlines you have been getting would not exist.The press must be onto them by now and it is only a matter of time before we start to learn more about these private citizens on publicly paid wages who control the rest of us through their swishing of judicial ermine as Mr Carlaw puts it very well. 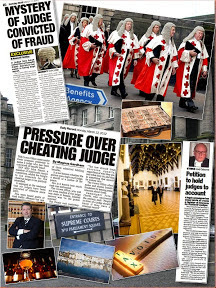 We the public have a right to know what is going on inside our courts.I said our courts not the judges courts. 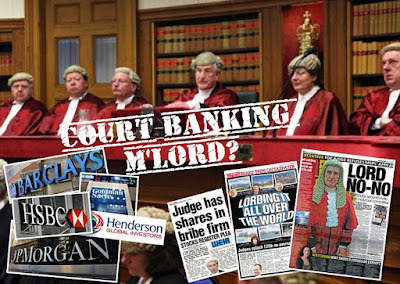 Instead of believing all these myths about the courts created by the justice system these are public courts and not some enterprise to fatten up the judges and their families for jobs and other earners.I have learned this from reading your site. You are providing the news to inform us about what is going on in what must be the untouchable area of the law and a damn good blog you are giving us.Keep up the good work! Moi Ali seems to have the right idea ,do the job with conviction and honesty, it is the first time I have seen this in any form connected to discipline of the personnel of the Legal System. 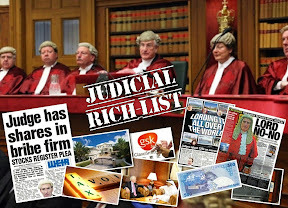 Very good and I like the way you have exposed the judiciary for what they really are which is a facade to prop up lawyers profits and obviously their own money making ventures they do not need to disclose. 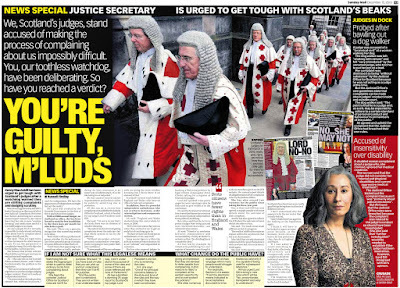 The judges head the entire legal system and as soon as anyone asks questions they throw up this judicial independence rubbish and start their threats.This is exactly the same they have done with your petition and the msps so you see they have far too much power.Anyone who can threaten a sovereign parliament and try to make it submissive is not worth a toss and is hiding a lot of dirt.This is what most of your readers will be thinking and rightly so.Go for it! 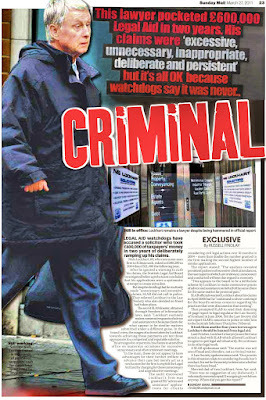 Well done to Moi Ali and finally we have someone in the system telling it like it really is. Fantastic to watch this and a credit to all who have made the petition and this debate at the parly! I would be surprised if this was NOT the case given the habit is to cover up and lie when you are discovered to be corrupt.Whatever the judges are they are people and people are generally liars when the whiff of suspicion falls on them. 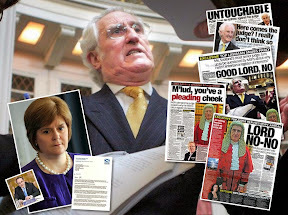 You can usually spot a liar or someone with something to hide because as soon as they are accused or questioned about what they are up to they start threatening everyone and refusing to answer questions.. err just like high ranking public officials who refuse to show up at the Scottish Parliament and threaten it with the law. 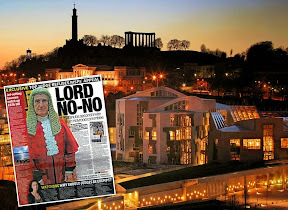 The judiciary are hiding their interests because they conflict with their office.It is the inevitable conclusion after watching Gill argue so vehemently against your petition.A judge would say exactly the same in court if an accused took the line Gill has with the MSPs so there you are m'lud..your own words fired back at you. 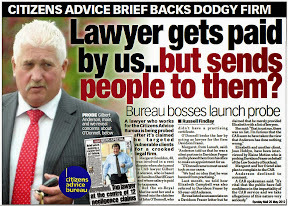 Well I have always suspected judges of not being very honest.You have confirmed it! 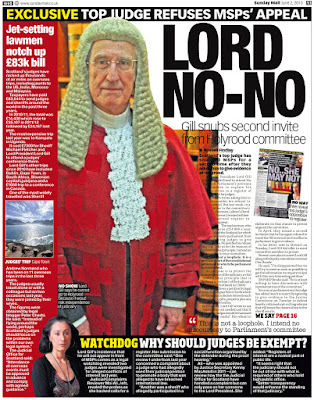 and proves Lord Gill WRONG! 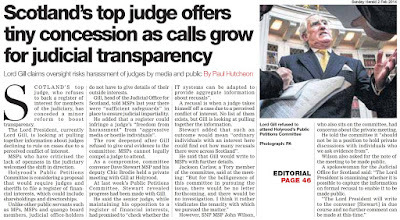 I agree that all of this delay is for a reason - to allow judges to 'get respectable' before the (hopefully) inevitable order for transparency is made law. 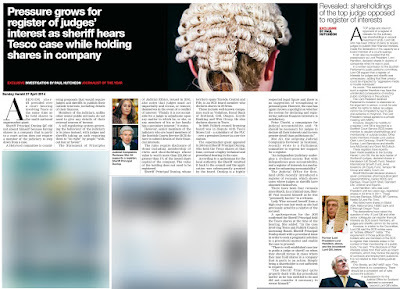 However I suspect there is a second reason for Lord Gill's studied procrastination, namely the fact that he does not believe he can rely on his colleagues in the Judiciary to be honest with him when declaring their interests. 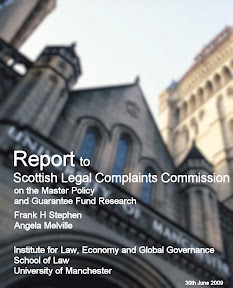 I like the heading of this report. He is defending the indefensible. 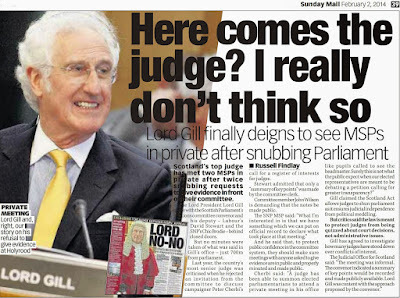 As Lord Gill makes decisions that affect the public his intransigence only deepens pubic mistrust. 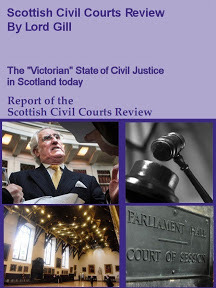 Ironic for a man who said Scotland's Civil Courts system was Victorian and failing society. Beware the unaccountable, those who want to operate in judicial darkness. Those in public life who want to operate in secrecy cannot expect public confidence in what they do unless power has gone to their heads. 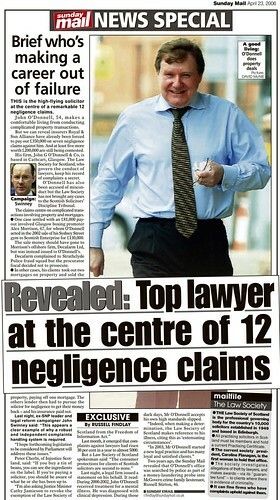 I had some good news today about a prominent Scottish Lawyer who has reaped his nemesis. 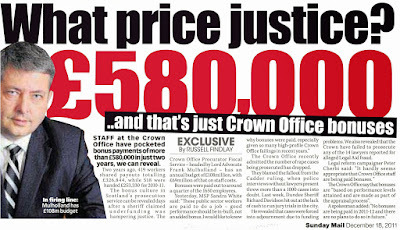 Keep up the pressure DOI a balance on power has to be fought for. If there is nothing incriminating in the register it is not a register. 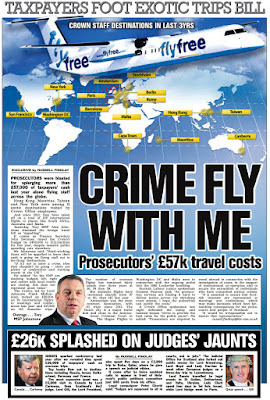 This is quite a feather in the DOI Teams cap - it certainly puts Which Magazine, Consumer Scotland and others to shame. This must be costing someone a fortune to keep off the telly.IT'S THAT OBVIOUS! 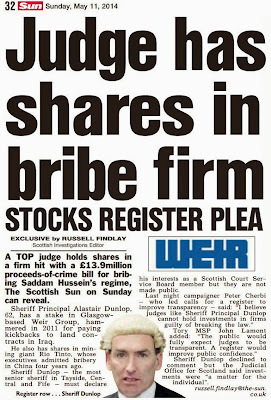 A judge tells me someone from Scotland is pushing for a register of interests and to read a blog. So I come here and get blown away by headlines we should have in any county where judges are not required to register their interests. 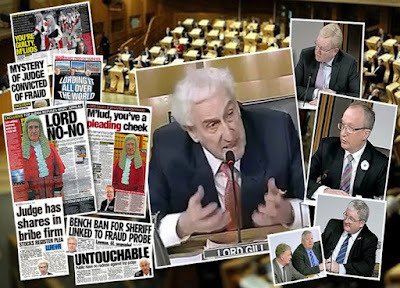 Why does Lord Gill feel he can arrange secret meetings with msps and then not show up in front of the cameras at the parliament? As others are saying there must be a lot to hide and probably a lot to fear coming out too.It can be the only answer to a judge willing to disgrace everything over openness. Interesting debate and have to wonder why there are no comments supporting the judges against your petition.Do you receive any such comments supporting the judges views on their own interests? The guys down the pub are already referring to 'doing a Gill', such is the disdain he has brought upon himself and his Office by his unacceptable conduct. 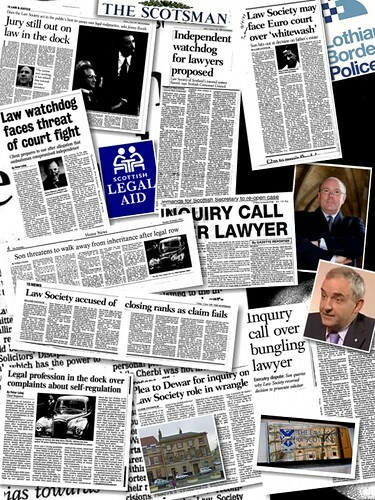 Look no further than the Law Society of Scotland! Why don't we back Ms Moi up and give her a department with staff who ensure transparency and accountability in Public Life? 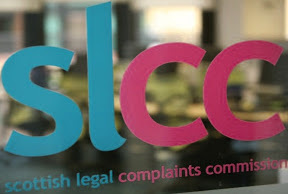 We could then put the Law Society of Scotland's corrupt wings; the Scottish Solicitor Discipline Tribunal and Scottish Legal Complaints Commission under her control as well as other areas like the Office Of The Freedom Of Information and the Citizens Advice Bureaux also badly influenced by the Law Society of Scotland? Only one reason I can think of makes people run this scared - Money and well hidden assets. 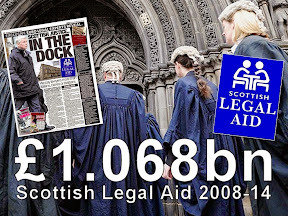 I am surprised some of your regulars have not picked up on this comment particularly with regard to the bedroom tax which arguably is going to split the country in half.Such a horrid evil tax implemented by the Tories safe in the knowledge their chums,donors and willing partners in the judiciary will thwart any legal challenge against it. 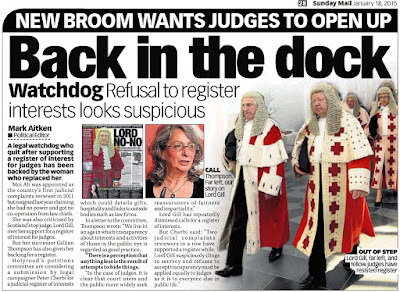 What we have here are the judiciary and truly horrid politicians working together to deny even the basic essentials of living to anyone they so choose to throw onto the street. 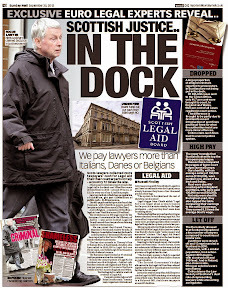 debate you have about judges so good to see it in media wonder why not happen until now? 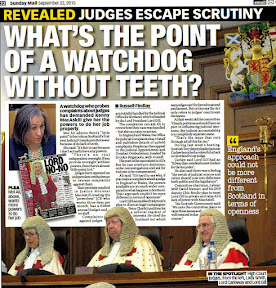 Brilliant!The truth about judges and how they fit in to public life finally comes out! Anyone with a genuine interest in justice and the judiciary should watch this video and read your blog! I bet the judiciary were not amused when they heard how Moi Ali told the truth about judges and what they get up to. 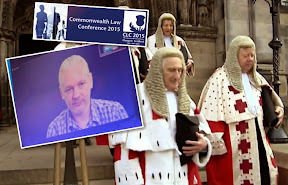 I'll watch this later on but from what I just saw of the video clip this must be the first time ever someone has dared to tell the truth about judges. Well done Moi Ali you have my eternal respect!